You may have been stuck in a meeting, perhaps on public transport waiting to get home and you cannot wait until it is possible to have a cooling vape, but disaster, the battery in your vaporizer is out of charge! No problem, help is at hand in the shape of the Efan X1 LCD Universal Charger, this single bay USB portable charger is designed to charge an array of different batteries. The Efan is fully compatible with a huge range of batteries, for example 18350, 18500, 18650, 26500 and 26650. It also is able to distinguish between IMR, Li-ion, LiFePo4, Ni-MH and Ni-Cd, C rechargeable batteries and it will automatically stop charging when complete, and the level of charge is neatly displayed on the LED with battery level display, it can even has reverse polarity protection, overcharge and short circuit protection. 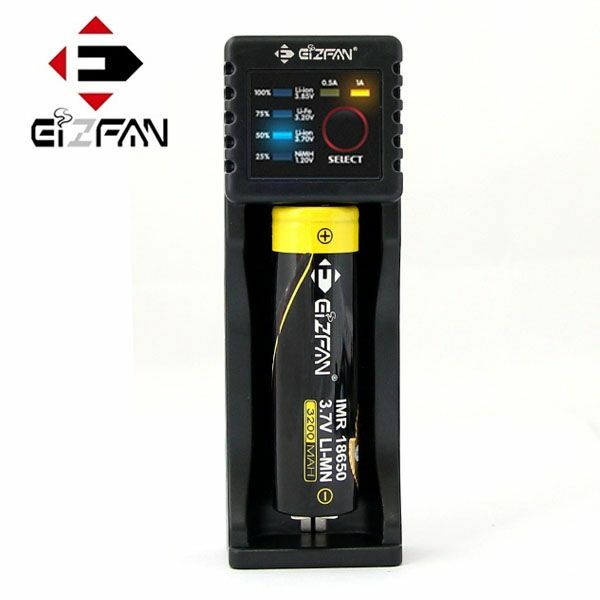 You may be saying to yourself, “well that’s okay but how do I find a convenient 3 pin socket walking down the high street”, Efan have thought of that because it will charge your vaporizer using energy from a fully charged cell to your phone from the USB lead which is provide along with a protective pouch. So for the price of a couple of pints and a pizza, you need never be without a vape for lack of battery charge ever again. The revolution in rechargeable batteries has enabled a huge number of portable devices such as mobile phones and vaporizers to be used. But the snag can be when they need to be re-charged in order to use the device and no power point is handy. This is where the Atmos power bank comes into its own. This handy pocket sized device is available in two outputs, 2,200mah size as well as a 5,000mah depending on how much your device is being used. 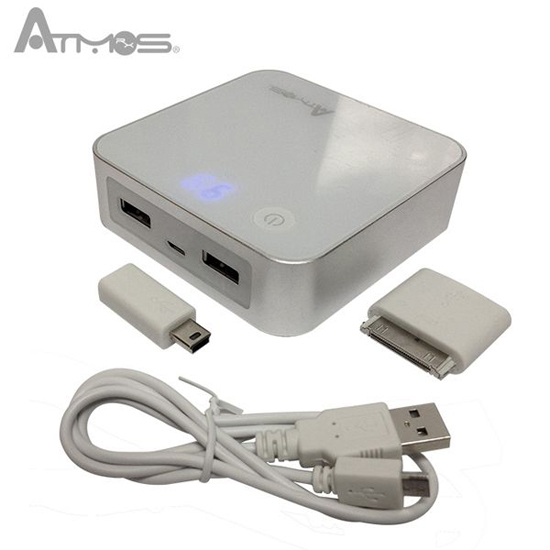 For example if using an Atmos vaporizer when out and about, the larger 5,000mah power bank will charge this and allow the user a full day of vaping without any need to re-charge it. The larger power bank is fitted with two versions of USB socket, one that provides a 1 amp output, the other a 1.5 amp which enables users to charge other devices in addition to an Atmos vape. Although the smaller 2,200mah power bank will fully charge a vaporizer, we recommend that it is used as a top up when the device is down to around half charge and this size has only a single 1 amp USB socket. The smaller 2,200mah version is offered in two colours, black or silver and the larger 5,000mah is supplied in a striking silver and white combination. With the Atmos Power Bank, your batteries need never run down again when out and enjoying a vape.